Welcome to my first article about a newly rediscovered hobby - model trains.When I was younger I had HO scale trains.I enjoyed them very much, but I always remembered the large space that the trains required.At least my parents had a nice big finished basement, and there always seemed plentyof room for one more hobby. These days, I don't have as much room for hobbies, so in order to give model trainsa try I need to use N (1/160 scale) or Z (1/220 scale) scale trains.N scale has much higher availability and lower cost than Z scale, so Idecided to go with that.Additionally, I wanted to buy something somewhat prepackaged to help speed upthe layout, so I decided on implementing the Woodland Scenics Scenic Ridge layout. 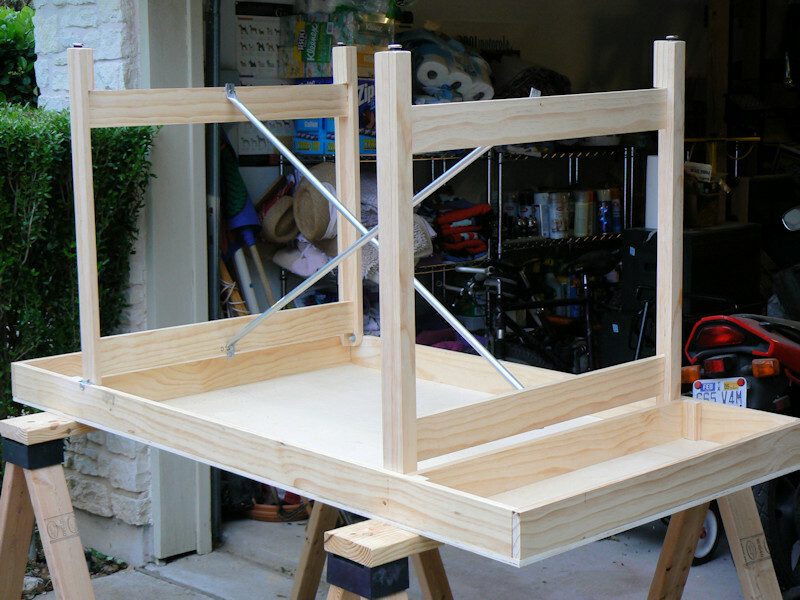 After deciding on this layout, the first thing I needed to do was build or buy asturdy 3 foot by 6 foot (0.9 m by 1.8 m) table.Since I have some experience with woodworking, I decided to build one.The basic requirements were a sturdy top and some folding legs so the layout can be stowedin the attic or transported in a truck. 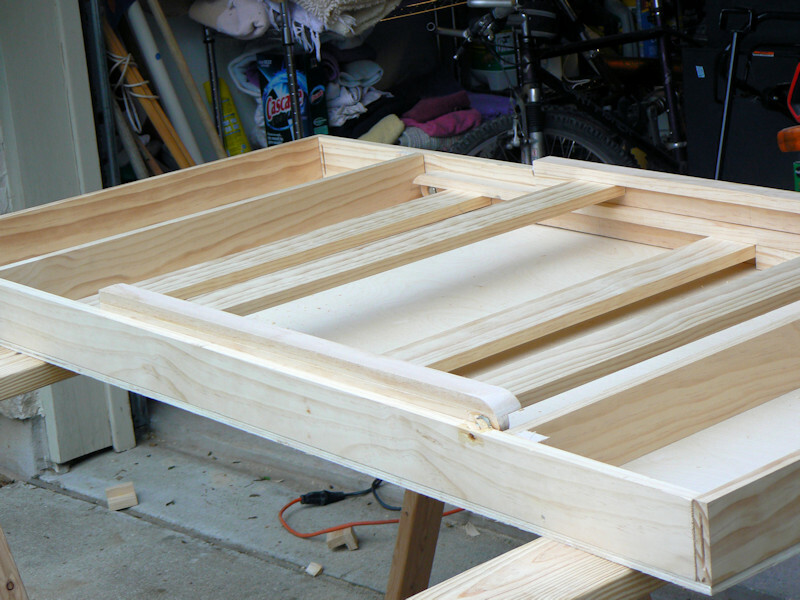 First I constructed a table top from some clear 3/8" (1 cm) plywood and some 1 x 4" (2.5 by 10 cm) braces.One of my favorite tools is a Dewalt plate joiner.This is also known as a plunge router or a biscuit joiner.Basically it cuts precise slots on two adjoining pieces of wood, and you fill the slotswith glue and a little, wooden, football-shaped biscuit, and then you have a strong, nicely aligned joint.You can cut as many slots as you like, but you only need about 4 for a 6 foot length.Shown in the first photo is the table top all cut, glued, and clamped. The top is upside-down and sittingon some work sawhorses. Click on the photos to get a larger image. 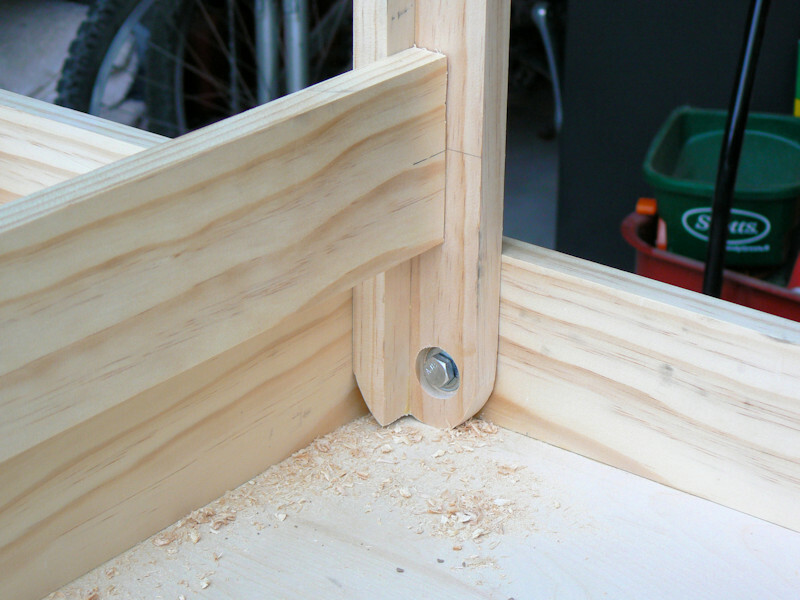 For each leg assembly, I made two horizontal braces (more 1 by 4s) and two angle shaped vertical legsfrom 1 by 2 inch (2.5 by 5 cm) lumber.These legs, looking somewhat like a letter H with two cross bars instead of one, havea rounded top and a bolt that attaches to the table top.The two legs can fold up under the table top by pivoting around the bolt. 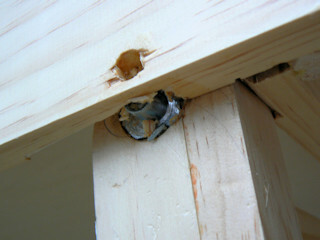 This photo shows a close up of the pivot bolt and the top of one leg. This photo shows how the two leg assemblies fold and tuck up under the table top. Hmm.Note how I have the one pivot very close to the edge of the table top side piece.Also note how I have the pivot bolt ending in a sleeve embedded inthe nice soft clear pine side of the table top.Not very robust, but this is what you come up with as you arecreating a design in your head as you walk up and down the hardware store aisle. Crackle-crunch.Engineering disaster number one.This photo shows how after one or two folds the table legs ripped the pivot boltsout of the side of the table top.The legs acted as a kind of lever and wrenched the sleeves right out of the wood. 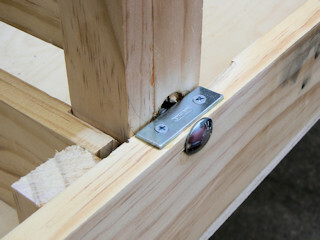 Lesson 1, soft lumber is not as strong as plywood, hard wood, or metal.Lesson 2, do not depend on wood to provide a strong point for hardware attachments: ratheruse hardware (such as a bolt and a nut) that goes through the wood and notembedded in the wood (e.g. sleeves, nails, screws, etc. )Lesson 3, learn to plan a little better so you only have to build things once. After a bit of creative problem solving and another trip to the hardware store,here is my solution.I decided a carriage bolt and a nut going through the wood would be much sturdier.Also I purchased a small steel strap plate to hold it in place. This should keep things in place. This last photo shows the finished table legs unfolded and perpendicular to the table top.To lock the legs in place and make the table extra sturdy, I made two diagonalleg braces from soft steel conduit pipes. The ends of the pipes are hammered flat and fixed to the leg braces with some hardware. Ker-runch.Engineering disaster number 2.Not learning from my first mistake, I decide to use some wood screws and a slot in the pipesto keep everything in place.Eventually the screws get ripped out of the wood and the slots get all bent and twisty and difficultto use.I remove the screws and drill holes through the braces. I redo the leg braces with simple holes.And I get a wingnut and a bolt to hold the bracing in place.In other words, get rid of the wood fastener hardware and use all steel solutions. 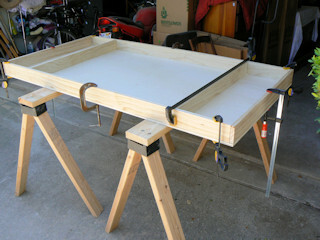 Last modified: Thursday, 09-Jun-2011 13:08:32 MST.